It would seem that I'm always saying goodbye to cool free stuff. I haven't been able to play tabletop role-playing games as often as I'd like the past year or two. The Zethul campaign I had been running is on hiatus. To stave off my gaming itch, I spend a few minutes here and there playing properly themed Facebook games. Sure, I play Words With Friends like a lot of folks, but my favorite games are from the fantasy genre. 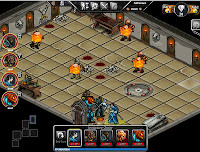 And I was delighted a few years back when I saw the first official Dungeons & Dragons game called Tiny Adventures. It was released in 2008 around the same time as fourth edition and I'd guess that part of the goal was to create brand awareness and get people interested. I never did more than glance at 4e, but I did get into Tiny Adventures as much as I could. It was single player, in the sense that your character played through the adventures alone. You started an adventure and then there was a countdown timer to the first encounter. It was also a little weird in the sense that there weren't a lot of real 'choices' for your character to make. At each encounter, your important success or failure was shrunk down to a single dice roll and then a countdown timer would start towards the next encounter. Your character survived or failed the entire adventure completely without your input or intercession. You started an adventure and could walk away or close your browser and then come back to learn how your character did. It was entirely text-based with a few flavor images thrown in. It seems weird but it worked. Somehow, this stripped down version of D&D still managed to be fun and entertaining. It was well-reviewed and I certainly enjoyed it. Unfortunately, it was abruptly cancelled and shut down in 2010. I was not the only one a little upset. I mean, I guess I understand that perhaps it was not really making any money for Wizards of the Coast. But there was nothing listed in the game or description that indicated that it was a promotional or limited-time game. The notice they posted made it seem like that had been the plan all along. Thank you all for participating in our promotional application of Dungeons & Dragons Tiny Adventures – it proved to be a tremendous success. Now that this promotion has run its course, you can look forward to many more great D&D experiences from both Wizards of the Coast and our partners in the future. Be sure to send your adventurer off on one last quest before the application comes down at 11 pm PST tonight. 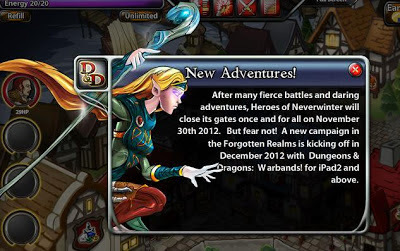 Fast forward to fall of 2011 and there appears on Facebook a NEW game called D&D: Heroes of Neverwinter. This game has more depth, more choices at character creation and it is more social. You can create your own character and your friends can create their character. You don't actually play together as you would if you were sitting around a table. When you get ready for an adventure, you recruit three others from among your friends for free or you can spend gold on NPCs. 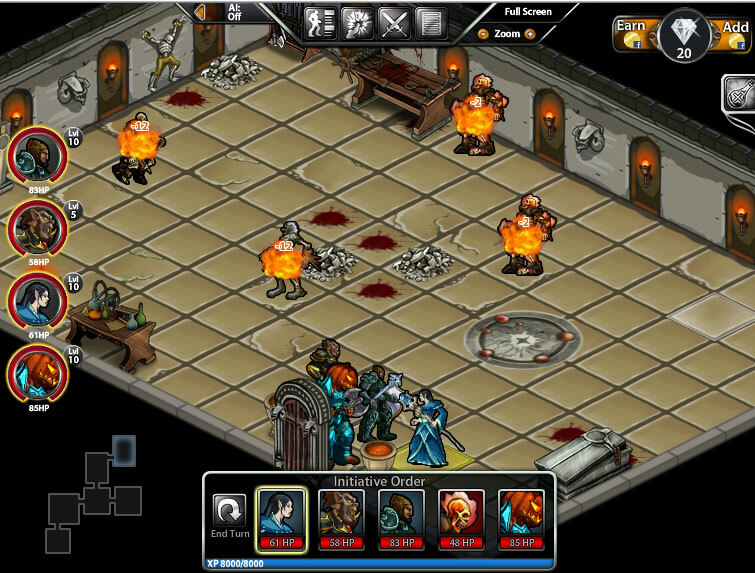 The combat is turn-based and you choose actions for each member of the party. This game is much more involved and more closely captures the spirit of the table-top game I'm familiar with. An adventure takes time, turns don't proceed unless you choose your actions and your character models can go anywhere in the encounter on a 2d grid map. It was also reviewed really well. There was also a trailer video with some in-game footage. And there was some really decent artwork. I can't recall when I first started playing this, but it was pretty cool right? Until this week. 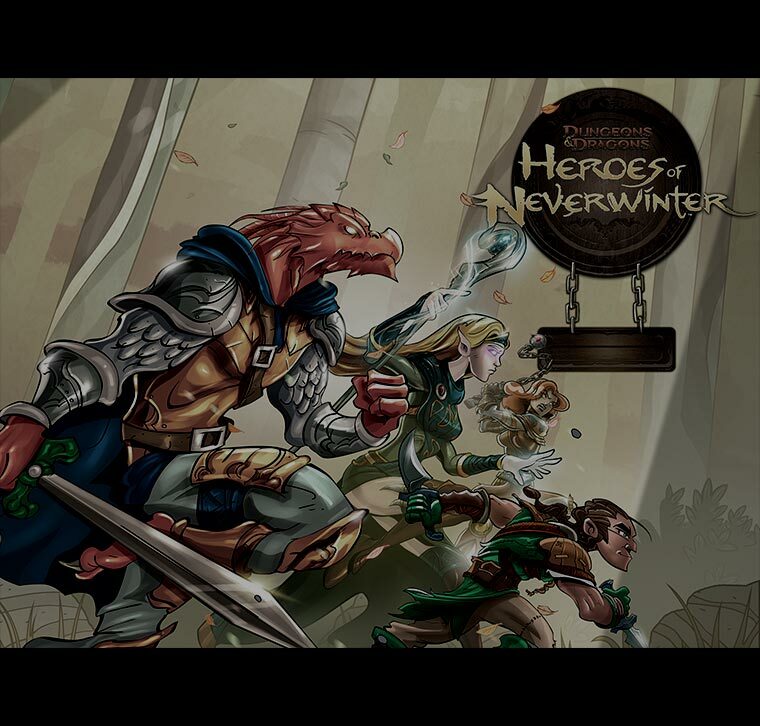 After many fierce battles and daring adventures, Heroes of Neverwinter will close it's gates once and for all on November 30th 2012. But fear not! 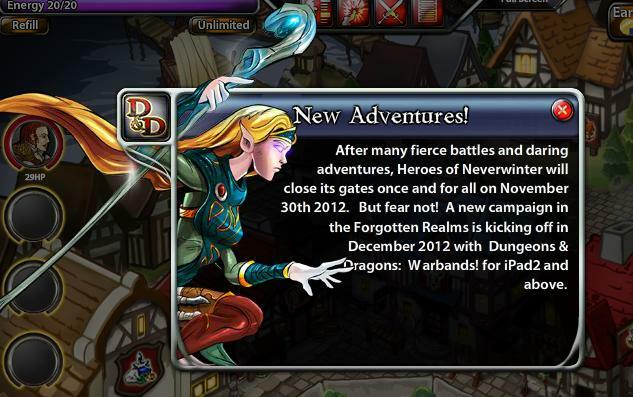 A new campaign in the Forgotten Realms is kicking off in December 2012 with Dungeons & Dragons: Warbands! for iPad2 and above. Rats. They are going to close down a good game, launch a new one and I think it's a mistake. I guess they aren't making money at this one either, or they have limited development resources and can only host and update one game at a time. I'm not sure I'll be able to play the new game if it is only going to be on the iPad 2. Even if it's available on PC, I'm very hesitant to invest time into this new game since it might be gone just as quickly. I know it's pretty vain to complain about free stuff on the Internet, but that's where I'm at in this moment. I'm guessing it has something to do with the digital rights to D&D being returned to Hasbro by Atari last fall. Heroes of Neverwinter is an Atari game -- wonder if the next game will be a Hasbro creation? Wade, you are probably correct and that's something I hadn't thought of. Digital rights might be the main reason behind this. It looks like the new game is ...also an Atari game. But that doesn't mean that licensing of the brand name expired and they needed to ditch the old game to renew.